It should be of no surprise that the Blackburn team loves a beautiful vintage rim that has kept its quality throughout the tests of time. So instead of giving away or throwing out your antique rims, we wanted to give you five creative ideas for displaying them instead. From whimsical to polished, we have some great suggestions that are sure to get your wheels turning! This project can vary greatly depending on your style. A small glass tabletop that is low to the ground will have a much different look than a long rectangle glass top with wooden accents that is 4 ft tall. For a more polished look, sand down the rims and give them a fresh paint job before assembling the table. This project is perfect for those with a green thumb!. After extracting the rim from the tire, you can weld the rim to a metal T post and like with the coffee table, sand and clean the rim before painting. Once dry, it’s ready to be staked to the ground and used! This light fixture shines in its vintage glory. You’ll need to soak the rim in rust remover and spray it with a protective clear coat to keep its lovely antique color. 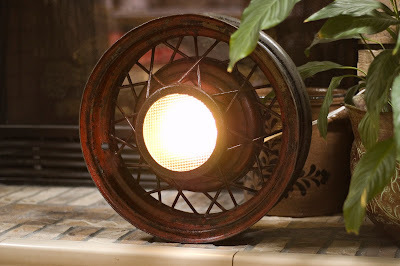 Insert a light fixture that fits into the middle of your rim and keep it all together with angle aluminum. Once it’s bolted you can relax and enjoy your beautiful home lighting. These clocks are very popular in quirky shops, but you can make one yourself and save a lot of money while creating something unique. This would also make for a great gift for a car enthusiast. 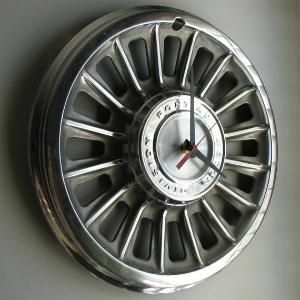 Although this one has a more polished style, we’ve seen car rim clocks using rulers for clock hands. This project’s only limit is your imagination! 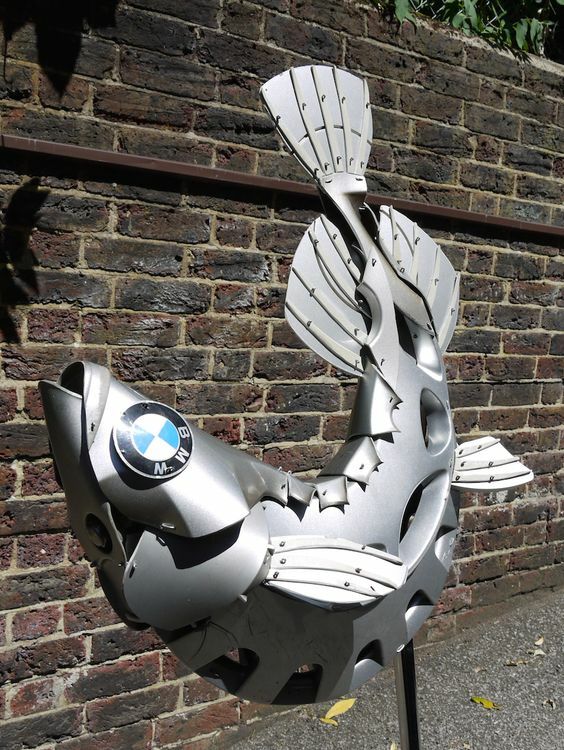 Hubcap Creatures showcases Ptolemy Elrington’s creations from hubcaps he has found (mostly on the side of the road). His creatures include fish, dog, and bird sculptures. While we can’t all create such magnificent masterpieces, it’s great to get inspiration. When Blackburn isn’t sculpting dragons out of vintage hubcaps or helping our customers find the vintage hubcap they’re looking for, Blackburn OEM Wheel Solutions is your top source for OEM wheels and OEM hubcaps.